Home » Heart Health » Blood Pressure » Do You Have White Coat Hypertension? Do You Have White Coat Hypertension? 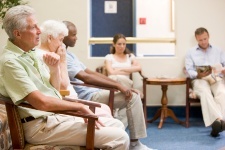 Have you ever felt nervous sitting in the waiting room of your doctor’s clinic? Does your mouth get dry or do you start to perspire or shake at the thought of seeing your doctor? You are there for your yearly physical examination and it’s taken quite a while to get an appointment. When your name is called and you are taken into the examination room by the nurse or receptionist, do you sit down and wait for the doctor to enter the room? When you are sitting there, are you thinking to yourself, what will the doctor do to me, what will the doctor discover, and will it be bad news? Now, you may not realize it, but your heart rate and blood pressure have just increased despite the fact that no physical exertion has occurred. When the doctor comes into the room and speaks to you, it becomes clear that this person is having a very busy day and this may also give you a sense of anxiety. During the physical exam, the doctor measures your blood pressure and remarks that your reading is higher than it should be. After a conversation regarding your general health, your doctor recommends some tests and writes you a prescription for your high blood pressure. After you leave the office, you decide to do some of your own research and after doing so, you come to the conclusion that you have none of the risk factors for high blood pressure. What do you actually have? It’s referred to as white coat hypertension. White coat hypertension is a very common occurrence. This happens when your blood pressure increases during a period of stressful anticipation when confronting health personnel who could be wearing a white clinic jacket. But considering the fact that your blood pressure will increase, and your doctor will likely prescribe blood pressure medication, you need to be able to tell if your symptoms are real or just white coat hypertension. MORE: Want to lower your high blood pressure with exercise? What I recommend is that you monitor your blood pressure every few days after you are relaxed and look at the average reading. If it remains high, you probably need to see your doctor for proper medical follow-up. If your blood pressure remains within normal limits, there would be little reason to take medication. What also could be happening is that your blood pressure may be higher during certain times and then fall within a relatively normal range at other times. It’s important to stay on top of your own health and to understand the white coat hypertension phenomenon; after all, once you start blood pressure medication, the cycle may never end. That’s why by monitoring your blood pressure every couple of days, you can figure out if your high reading was just a bad case of the nerves.